We did it! My Steelers and your Browns won simultaneously. That must be some kind of record. The Steelers played the Colts, so the game was carried locally. And what a game it was! The final score was 51-34. And it was a night for history - Big Ben threw for six touchdowns (new team record) and had his second 500-passing-yard game (new league record). 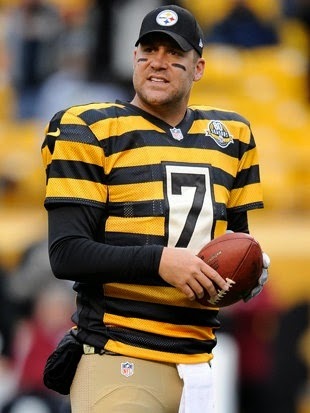 It was also throwback uniform day and they pulled out the old bumblebees from 1933. They played so well that I forgave them. All I did today was knit and watch football. And take a two-hour nap before the game. My glute is much better and my hip flexor is much worse. Nothing surprising there - there are few things harder to heal than a hip flexor. It's been two weeks since I had a day to stay home, so the animals enjoyed it. I had a variety of them on me all day, cuddled up in different combinations. A good time was had by all. Except maybe the Colts. But that's okay. I have a complicated relationship with them. It's hard to forget the way they snuck out of Baltimore under cover of darkness years ago. And if they'd stayed where they belonged, there would be no Ravens. And that would be good, since the Ravens were the Browns snuck out of town under the cover of darkness. I cheered for them during the Manning years and I like Luck. But they were mean to one of Archie's boys. Tonight was uncomplicated - I'd cheer for my Steelers against anybody. The good guys won, the sock is progressing, and I rested my pulled muscle. I should sleep well tonight. I'll miss you under these lovely flannel sheets.